Were the 2013 Moscow Elections falsified? Here they are. The turnout was 32%. Navalny’s support – among those who indicated a clear preference for one candidate or another – rose from the single digits in June to around 20% on the eve of the elections (Levada, VCIOM, FOM, Synovate Comcon). 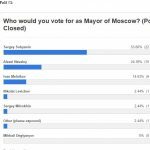 All the polls – even including the SuperJob poll that only queried active workers, aka excluded pro-Sobyanin pensioners – gave Sobyanin more than 50% in the first round. His actual result massively exceeded expectations. By common consensus, this was because the “party of the couch” won; although close to 50% of Muscovites were saying they were going to vote, only 32% ended up doing so. These were mainly Sobyanin supporters who were, nonetheless, loth to shift their butts to vote for an uninspiring if competent technocrat who had ran a most lacklustre campaign. In the SMS-ЦИК program, accredited election observers would send text messages from their polling stations with numbers from the protocols at their precinct. They could then be compared with the official CEC numbers. And Sobyanin’s result here was 49.52%. Does this mean he really did cheat Navalny out of a second round? Well, not necessarily. Here’s a key caveat. Far from all polling stations were covered by the SMS-ЦИК. Their figures thus have a significant margin of error. I would speculate that the bias is, in fact, more likely to be in favor of Navalny than of Sobyanin, because the observers who would get involved in this project in the first place would likely be more liberal-leaning in the first place, would on average appear more frequently in the more oppositionist areas of town, and would and come to observe their local station. Still, it’s not a shut and closed case. Someone should really make an analysis of which areas where covered by this program – and whether the sample really does favor Navalny as I reasonably hypothesized above. These are, admittedly, all over the place. The Center of Political Technologies gave Sobyanin 56% and Navalny 29%; FOM – Sobyanin 52.5%, Navalny – 29%; VCIOM – Sobyanin 53%, Navalny 29%. An exit poll carried out by Navalny’s supporters gave him 35.6% to Sobyanin’s 46%, while the Communist Party claimed their candidate Melnikov performed much better, with 19%, than he did according to the official 11 – though their poll still gave Sobyanin a first round victory with 51%. In conclusion, four out of five exit polls gave a first round victory to Sobyanin. The only one that didn’t was carried out by explicit supporters of the opposition candidate. 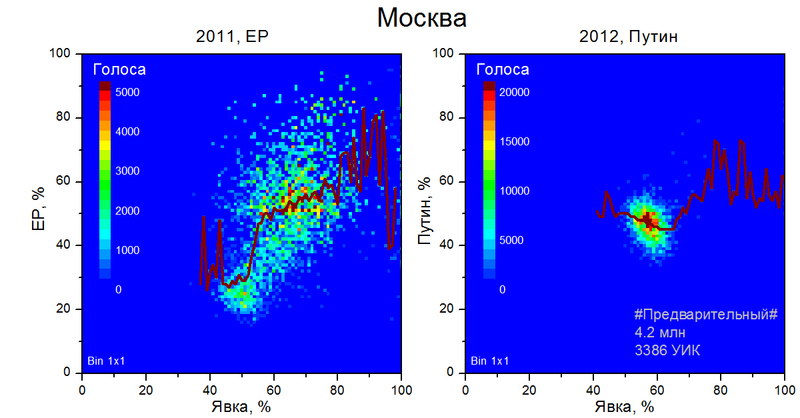 The art of electoral fraud detection via statistical means has come a long way (and has – probably not coincidentally – been mostly spearheaded by Russian mathematicians). You can read the details here. Suffice to say that for a relatively homogenous city like Moscow, it is expected that each candidates turnout to vote share graph should resemble a Gaussian curve. And here it is for 2013: The mean for Sobyanin is 51.65%, and for Navalny – 28.1%. Or, expressed in the form of a “heat graph” for any one candidate in which the turnout at each station is graphed to the result there, it should form a single concentrated dot. A long tail leading up and to the right, as well as additional distinct dots – especially if they are concentrated at around the 100%/100% – constitutes strong evidence for systemic election fraud. In regards Moscow, its elections were clean up to and including 2003 or so. But then it started growing ever thicker tails, and additional concentrations popped up, to reach absolutely bizarre and astounding levels in the 2009 City Council elections and the 2011 parliamentary elections. But then it seems obvious that some kind of order and directive was passed down to clean them up, and the graphs snapped back to what they were before 2004 during the 2012 Presidential elections. Now here is the heat graph for 2013. Which of the above does it most closely resemble? The verdict: As in 2012, but not in 2004-2009, the Moscow mayoral election of 2013 didn’t see any significant fraud and Sobyanin won legitimately in the first round.